Well, we got away with it. Our blog yesterday “New ‘phone aware’ cameras on test in UK” was widely shared across Facebook, Twitter, Google+ and LinkedIn. Traffic to the story was significantly up on normal levels, and referrals to the site from social media were the highest ever as a proportion of our web site traffic. But is was an April Fool. 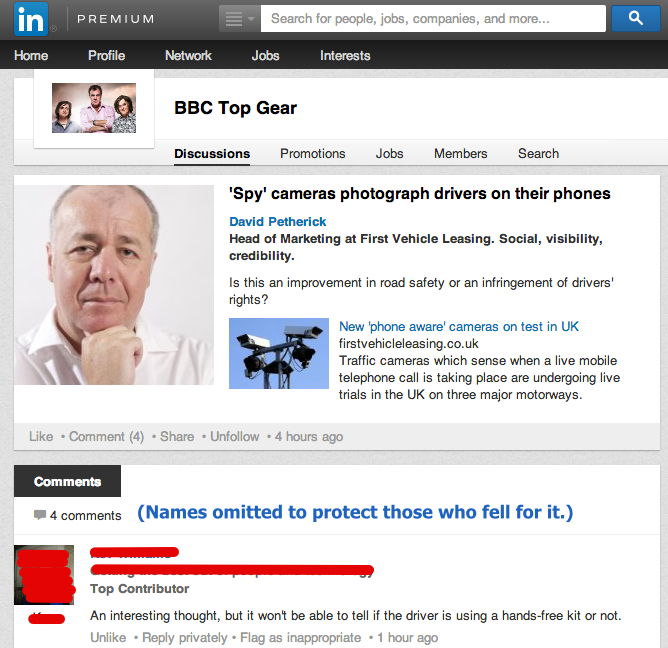 Even the BBC Top Gear forum on LinkedIn fell victim to our little ruse, with a number comments being added, all answered deadpan by FVL. “The secret of a successful April Fool’s joke is including just enough detail, context and credibility to make people think it’s for real. With this piece, I made sure there were a couple of unsubtle clues, such as the fact that the source was quoted as The Guardian, but the link from that citation, and from the photo, were actually ‘rickrolls‘ to a Rick Astley video. I also added an obvious inline citation that said ‘1st April 2014′. Our ‘phone-aware’ safety camera spoof fooled a lot of people. “However, there were several credible quotes (all completely fabricated) from various bodies who we have cited before in our blogs related to road safety, but there’s no Police Area called West Murcía. West Mercia, yes. Murcía is in Spain. The photo, too, sourced from Wikipedia, has a few little ‘dangly bits’ in addition to the standard cameras, which few people outside the road management or highway safety industry would recognise. Mentioning military-standard infra-red is the kind of detail that lets you swallow the big fib. I even managed to fool a few members of our staff for a while, although I must admit one of them did spot it instantly. Of course, he was censored until now. Did you get fooled by an April Fool story yesterday? Should drivers who use their phones be named and shamed? This entry was posted in News and Views and tagged april fool, myfvl, road safety, safety cameras by David Petherick. Bookmark the permalink.